The index for the book has been completed and the final edits have been done. McFarland will be sending the book to the printers by August 24, 2014, pending those edits and the index that I will be sending over to them. Here’s the funny part: Before I can send anything, I have to wait and see what Seattle Mariners ace right-hander Felix Hernandez does in his next start this week. Why is that? Well, it’s because on July 25, “King Felix” tied a long-standing record in the Mariners’ 2-1 loss to the visiting Baltimore Orioles. In that outing, Hernandez fanned 10 Orioles and allowed just one run over seven innings. It was his 13th straight start with seven or more innings and two runs or fewer allowed, tying Hall of Famer Tom Seaver’s 1971 record. So, it’s a matter of waiting to see what Hernandez does in his next start so this page can be properly edited to reflect what has happened in 2014. You just never figure that a record like that would be matched – and potentially broken – at an inopportune time like this! Murphy’s Law, I suppose. Other than that, everything has been completed! Now it’s time to see what “King Felix” does in a couple of days – ironically against one of Tom Candiotti’s former teams, the Cleveland Indians. A change of pace today on A Life of Knuckleballs… Instead of big-league musings, we’ve got some minor-league ball for you. In Northwest League (Short-Season Single-A) action, the first half of the season wrapped up on July 21, with the first-half pennants in both divisions being decided in the final moments. In the South Division, the Hillsboro Hops (affiliate of the Arizona Diamondbacks) and the Boise Hawks (Chicago Cubs) battled until the penultimate day before the first-half championship was won. On July 20, Hillsboro took on the Emeralds in Eugene, OR, and scored the winning run in the top of the ninth inning to pull out a 3-2 victory. Half an hour later, Boise dropped a 6-1 home decision against the Salem-Keizer Volcanoes, clinching the first-half championship for Hillsboro. While the Hillsboro-Eugene tilt was decided in the ninth inning, the winning rally was hardly dramatic. The Hops’ victory was made possible when, with runners on first and third with none out, Eugene opted not to play the infield in. A routine grounder to second base by Hops third baseman George Roberts, with the Emeralds playing at normal depth, drove in the tie-breaking run and gave Hillsboro the pennant-clinching 3-2 decision. The Hops went on to lose 13-7 to Eugene the following day – in what was a meaningless contest for them – to finish the first half with a 22-16 record. Boise, with a 7-6 win over Salem-Keizer, also finished with a 22-16 mark. However, with the Hops owning the tie-breaker, it was Hillsboro clinching the first-half pennant in just their second season in the Northwest League. Prior to the 2013 season, the franchise was located in Yakima, WA, and was known as the Yakima Bears. For Boise, an early-season funk proved to be costly, even though its 15-5 record in July allowed them to end the first 38 games of the schedule with the same record as Hillsboro. After opening the season with three straight victories and a 4-1 record, the Hawks, who made it to the Northwest League finals in each of the last two seasons, proceeded to drop seven in a row before rebounding once the calendar turned to July. Over in the North Division, it was essentially the same story, with a second-place club stumbling out of the gate before a furious rally at the end proved futile. The Vancouver Canadians (affiliate of the Toronto Blue Jays) were 5.5 games back of the Spokane Indians (Texas Rangers) heading into July. However, the Canadians made it close as they were arguably the hottest team during the final week of the first half, led by centerfielder and leadoff man Roemon Fields, who stole 28 bases to establish a club record for a full season . Vancouver outscored its opposition 66-30 and won six of its final seven games, including a 10-6 triumph over the Tri-City Dust Devils in a day game at Gesa Stadium in Pasco, WA, on July 21, the final day of the first half. That final victory, which saw ace right-hander Miguel Castro improve to 5-2 and 18-year-old shortstop Franklin Barreto drive in three runs and cross home plate twice, allowed the Canadians to finish the first half with a 25-13 record, a half-game ahead of Spokane going into the Indians’ contest that same night. Unfortunately for Vancouver, the Indians owned the tie-breaker thanks to a 4-2 head-to-head record, meaning if they won their night game they would finish 25-13 as well to clinch the first-half pennant in the North Division. Going into that finale, the Indians had lost five of their last seven, but Spokane left-hander Derek Thompson ensured there would be no collapse for his club. The 21-year-old Thompson, who was selected by the Texas Rangers in the 12th round of the 2013 MLB amateur draft, allowed only three hits over seven innings with 10 strikeouts, pitching the Indians to a 3-0 victory over the Everett AquaSox and giving the North Division’s first-half flag to Spokane. For Vancouver, the three-time defending Northwest League champions, finishing just short in the first half is nothing new. Back in 2011, the Canadians also lost the first-half pennant due to a tie-breaker, before winning the second half en route to the first of three consecutive league titles. 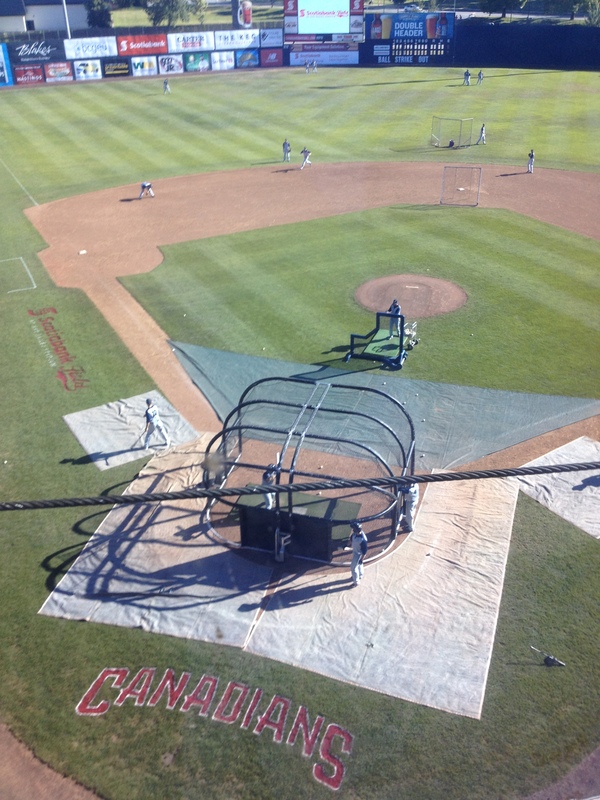 In 2012 and 2013, the Canadians also made the playoffs by winning the second-half pennant. So, it will be interesting to see how they fare in the second half of the 2014 Northwest League season. The Vancouver club record over a full 76-game schedule had been 25, established in 2007 by Michael Richard in his lone season with the Canadians. Richard swiped those bases while playing in 61 games with Vancouver in his first professional season after being selected in the 11th round of the MLB amateur draft that June by the Oakland Athletics, then the parent club of the Canadians. Fields, however, shattered that record in the first half alone. What big series in September? It’s always amazing to read and hear how delusional those covering the Toronto Blue Jays are. Remember back in May when the Blue Jays went 21-9 and were in first place? They were as many as six games up in the AL East on June 6 following their sixth straight win, a streak which included a three-game sweep in Detroit. 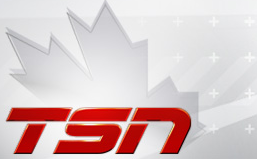 At the time, the scribes on TSN.ca were writing all sorts of garbage about how the Blue Jays-Orioles three-game series to close out the season would be significant, comparing that season-ending set to the 1989 series when Toronto clinched at home against Baltimore to win the division on the final weekend of the campaign. Those scribes were reminiscing about how magical those ’89 Blue Jays were and were trying to suggest – at least that’s what it seemed to me – the 2014 edition were on their way. And yes, as TSN.ca correctly pointed out, back in 2000 the Rays (who were known as the Devil Rays at the time) did trade right-hander Steve Trachsel to the Blue Jays down the stretch. But really? Trachsel was a journeyman pitcher and Tampa Bay was a horrible team back then. Does TSN.ca really expect the Rays, a perennial contender, to trade a marquee ace such as David Price to the Blue Jays? Even if they were to give up on the season and trade Price, he would likely be going to a National League team. Definitely not Toronto. Again, it’s just amazing how, year after year, the delusional Toronto media seems to have a complete lack of knowledge of the game. During the first half, whenever I had a baseball conversation with Blue Jays bandwagon fans around me, I always told them, “Oh, by the way, there’s still a second half of the season to play.” Apparently, even those scribes in Toronto, particularly the ones writing for TSN.ca, are clueless about that too. One needs not be a baseball historian to know that large deficits in baseball are surmountable, even if he/she hasn’t heard of the 1951 Giants, 1978 Yankees, or 1914 Braves. Even in the last 25 years alone, we have seen numerous examples. In 1995, for instance, the Mariners (the Blue Jays’ expansion cousins from 1977, by the way) rallied from an 11-game deficit to eventually overtake the Angels. The 1991 and 1993 Braves rallied from 9.5- and 10-game deficits against the Dodgers and Giants, respectively. (And don’t get me started on those Expos fans who seem to think their team would have won the 1994 World Series. The Braves could have overtaken them down the stretch, and as most fans know, teams that make it to the postseason for the first time in a long time – which the Expos would have been in 1994 – rarely win it all in their first try.) Heck, even in that historic 2011 season, the Braves had an 8.5-game lead at the start of September, but collapsed in that final month. So, it’s happened before – and will again. Then again, why would the scribes covering the Blue Jays know anything? From listening to their analysts and reading their columns, it’s like the Blue Jays play in a vacuum and the rest of the baseball world doesn’t exist and doesn’t matter. A few days earlier, It’s Pronounced Lajaway had a piece on the greatest Indians players to never make an All-Star team. Knuckleballer Tom Candiotti, who pitched for the Indians from 1986-1991 (and again in 1999), made the list at No. 5. As I’ve referenced in other posts in the past, Candiotti’s Tribe career was pretty impressive in hindsight. He posted an ERA+ over 125 in three of his six seasons in Cleveland. If you think Kluber got snubbed this year, check out Candiotti’s situation from 1991. With a 2.23 ERA in 17 starts (6th best in all of baseball), Candiotti was left off the roster. Meanwhile, due to postseason heroics which almost got him into the Hall of Fame, some guy named Morris started the game for the AL—with the 43rd best ERA in baseball at 3.65. Of course, as I had posted here recently too, Candiotti would have made the American All-Star team had he not been traded to Toronto a mere 10 days prior to the Midsummer Classic. I want to focus here on Candiotti vs Morris, though, since it was brought up on It’s Pronounced Lajaway. 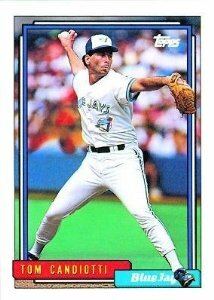 Candiotti normally struggled in first innings of ballgames because it took a few frames for him to get the feel for the knuckleball, but interestingly, Morris was even worse in his 21-win season with Toronto in 1992. That season, Morris had a 6.88 ERA during the first innings of his 34 starts, allowing 26 earned runs and 14 extra-base hits. In 1991, Candiotti gave up 15 first-inning runs in 34 starts, for a 4.01 ERA, and nine extra-base hits. But Candiotti’s first-inning ERA was skewed because seven of those runs came in the one game where he received multiple for a bad tooth just prior to taking the mound. In any event, Morris’s 6.88 ERA in the first inning in 1992 was a lot worse. Former major-league pitcher Jim Kaat, working the broadcast booth for CBS during the 1992 postseason, explained Morris’s first-inning woes this way during Game One of that year’s ALCS: “When you throw the forkball, it’s difficult to find the release point” and get that pitch in the strike zone early on. The idea that it took a few innings for Morris to see if his forkball was sharp or his fastball was effective, before he decided which pitch to go with. So, essentially, it took Morris a few innings before he settled down. And once he had his pitches working, he’d be untouchable the rest of the game. That’s not all. As Kaat also pointed out, because of Morris’s high leg kick and the use of the forkball, the ball took a longer time to get to home plate, making Morris easy to steal bases on throughout his career. 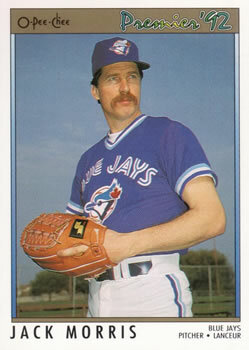 In fact, Morris was one of the easiest pitchers to steal on in the AL during that era. Wait a minute. Morris had a tendency to struggle in the first innings of ballgames. Because he threw a forkball, Morris was easy to run on. Those two characteristics were consistent with knuckleball pitchers such as Candiotti and Charlie Hough. So, why did knuckleballers get more scrutiny than a guy who threw a forkball? Hough himself wondered the same thing during the spring of 1992, some five months after Morris had captured World Series MVP honors with Minnesota. “Some managers would say they wouldn’t have a knuckleballer on the staff with all the wild pitches and passed balls,” Hough told the Chicago Daily Herald, referring to the negative perception toward knuckleball pitchers. “But there are more wild pitches on a forkball or a splitter. If Jack Morris throws a wild pitch or passed ball and gives up a big run on it, it’s all right. But when I do it, it’s the god-darned knuckleball” (Mark Ruda, “Is the Knuckleball a Dying Art? Not on the White Sox,” Chicago Daily Herald, April 5, 1992). Then there’s also bases on balls. Managers hate knuckleballers because of the walks associated with them. But in 16 seasons, Candiotti finished in the top 10 in walks allowed only twice. Meanwhile, he was in the top 10 for fewest walks allowed per nine innings a total of three times. Morris, however, finished in the top 10 in most walks allowed nine times in his 18 major-league seasons, and never once finished in the top 10 in fewest walks per nine innings. So, managers prefer a forkball pitcher because…? Wild pitches? Morris was in the top 10 in his league in that category a total of 12 times, leading the league six times and finishing second twice. Candiotti was in the top 10 in wild pitches “only” seven times. He never led the league in that category, and his 14 wild pitches in 1998 represented a career high. Morris equaled or surpassed that number several times; he had seasons with 18, 14, 15, 24, 16, 15, and 14 wild pitches. Round-trippers? Six times, Candiotti finished in the top 10 in the league in fewest home runs allowed per nine innings. He never led the league in homers allowed, finishing in the top 10 only twice, including a career high of 30 allowed in 1998. Morris was in the top 10 in homers allowed seven times, and had seasons in which he allowed 37, 30, 40, and 39 long balls. So, Candiotti owned low home run and walk rates—and managers didn’t like a pitcher like him because…? In Game One of the 1992 ALCS, Morris had an atypical flawless first inning against the Oakland A’s. But his early-inning woes would bite him in the second frame, as he allowed three runs – including back-to-back homers – and Toronto went on to lose 4-3. In Game Four, he allowed five runs in the third inning as the Blue Jays trailed 6-1 entering the eighth. Oakland seemed destined to win that contest to even the ALCS at 2-2, but the 1992 Jays weren’t the same team as the offensively-challenged ’91 club. The ’92 Jays were a more balanced team, and it was no cakewalk to go through their lineup. John Olerud and Candy Maldonado had solid seasons, and Toronto also had a legitimate designated hitter in Dave Winfield. (The DHs in the 1991 ALCS were a combined 2-for-18 after putting up horrendous regular-season numbers.) With Winfield hitting behind him, Joe Carter saw more fastballs because pitchers didn’t want to walk him and have to deal with the dangerous Winfield with runners aboard. I n 1991, if the Jays were trailing by that kind of a margin – 6-1 in the eighth inning – the game was essentially over since they didn’t have much of an offense beyond White-Alomar-Carter atop the batting order. No such problem in 1992. An Alomar double and Carter single cut the deficit to 6-2. Winfield then singled Carter to third, prompting A’s manager Tony La Russa to bring in closer Dennis Eckersley. It didn’t matter. Olerud and Maldonado each smacked RBI singles to make it 6-4. An inning later, Toronto tied it off the seemingly invincible Eckersley, and then prevailed 7-6 in extra innings. The comeback overshadowed a horrible outing by Morris, whose numbers were: 3.1 IP, 5 H, 5 R, 5 ER, 5 BB, 2 SO. Not unlike Candiotti’s in Game One in 1991: 2.2 IP, 8 H, 5 R, 5 ER, 1 BB, 2 SO. The ’92 Blue Jays would win the AL pennant before stunning Atlanta in six games in the World Series. And oh, Morris lost twice against the Braves. Though Jack Morris defeated Candiotti’s Blue Jays twice in the 1991 ALCS, the Candy Man has nothing but praise for the right-hander. “Jack Morris was the greatest competitor I’ve ever seen on a big-league mound,” he said several years ago on the subject. “Jack might not have had an outstanding ERA, but he had this refuse-to-lose mentality and was definitely a big-game pitcher. The bigger the game, the better Jack was. He could beat you 1-0 or he could beat you 10-9. He always wanted the ball and he never wanted to come out of the ballgame. That’s what you want out of your starting pitcher. That’s the guy I’d want on the mound for a seventh game in the World Series. One time, it was because of a catcher’s unfamiliarity with Candiotti that cost him a game against Morris. Joel Skinner, who was traded to Cleveland before the 1989 season, had caught Yankees knuckleballer Joe Niekro five times from 1986-87. However, for the first five months of the ’89 season with the Indians, he’d caught Candiotti just once – way back in April – because Andy Allanson was the Candy Man’s personal catcher. In September, though, interim manager John Hart wanted to see what Skinner could do behind the plate, and inserted him into the starting lineup in a game against Morris. Gary Pettis led off with a single, stole second, and moved to third on a passed ball. Candiotti then fanned Fred Lynn but Skinner couldn’t hang on to the third strike, which got away for another passed ball, allowing Pettis to score. “After that inning, Skinner switched to the big glove,” said Candiotti. “And he did a great job the rest of the way. In fact, he was terrific in handling my knuckleball whenever he caught me [from that moment on].” Despite Candiotti’s solid game – two earned runs over 6.2 innings – Morris was victorious 3-1. Though Morris said years ago he didn’t need luck to beat Candiotti, based on some of those games it seemed like he did. *Skinner wasn’t the only catcher who learned the lesson the hard way. When Dodger catcher Carlos Hernandez first caught Candiotti during spring training in ’92, he didn’t want to use the big knuckleball glove – and soon regretted that decision. “Carlos was catching me in the bullpen and he was just using a regular catcher’s glove,” said Candiotti. “I threw my hard knuckleballs and a few of them hit him. After that, he gave up and went with the bigger glove.” With the oversized glove, Hernandez missed only three of Candiotti’s pitches during the entire game. On July 12, lefty Paul Maholm got his first start in two months and pitched his best game of the season, in the Los Angeles Dodgers’ 1-0 victory over the San Diego Padres. For Maholm, it was his first start since a 3.2-inning, 10-run disaster against the Miami Marlins on May 14, and also his 250th career major-league start. The lefty tossed six-plus shutout innings of two-hit, no-walk ball against the Padres, and the Dodgers won it in the bottom of the ninth off San Diego rookie Kevin Quackenbush . Because the Dodgers couldn’t score when Maholm was still in the game, he received a no-decision to remain 1-4 on the season, though his ERA dropped from 5.18 to 4.69 . Of course, Maholm hasn’t had a good season so far, with a 4.74 ERA as a starter and an equally-mediocre 4.58 earned-run average as a reliever. But hey, if you pitch into the seventh inning and give up just two hits, you deserve a win, right? Especially in a milestone appearance, such as Maholm’s 250th career big-league start. Then again, sometimes in baseball you have certain pitchers who just don’t seem to have any luck, even when they pitch well. I remember lefty Brian Bohanon’s 1998 season when he was acquired by the Dodgers in mid-July from the New York Mets in exchange for veteran reliever Greg McMichael. At the time, eyebrows were probably raised, because Bohanon hadn’t had a stellar career up to that point (and wouldn’t the rest of his days in the big leagues after that ’98 campaign) . Since making his major-league debut with Texas in April of 1990, Bohanon had compiled a 5.35 ERA in his first eight seasons with four teams (Rangers, Tigers, Blue Jays, Mets). He had appeared in 178 big-league games, only 61 of them starts. In 1994, his last season with the Rangers, his ERA was 7.23. The following year, in his lone season with Detroit, it was 5.54. Then a 7.77 ERA for Toronto in 1996 in 20 appearances, all in relief. Yet, with the Dodgers in 1998 following the trade with the Mets, Bohanon was immediately inserted into the starting rotation, and the veteran lefty somehow delivered. He logged a 2.40 ERA in 14 starts, tossing two complete games. In 97.1 innings, he allowed only 74 hits and struck out 72 batters. The problem? The Dodgers couldn’t score for him. As a result, Bohanon was only 5-7 with the Dodgers. Also, as mentioned above, he tossed two complete games with Los Angeles – but he lost both games. On September 11, Bohanon pitched eight innings of seven-hit ball with eight strikeouts in San Diego, but the Dodgers lost 1-0 to Padres righty Joey Hamilton. In his final appearance of the season – and as it turned out, his final game with the Dodgers – he gave up only three runs over his nine innings of work, but lost a 3-2 decision to San Diego right-hander Andy Ashby. Following the season, he joined the Colorado Rockies, where he would pitch his final three major-league seasons. Though he won 29 games for the Rockies, he also lost 30 and pitched to a 5.82 ERA with Colorado. But a 5-7 record even with a 2.40 ERA for the Dodgers? That’s pitching in hard luck. There’s also lefty Odalis Perez – who like Maholm also used to pitch for the Braves. Sure, Perez was mediocre toward the end of his career. But he also won 15 games for the Dodgers in 2002, his first season in Los Angeles. Two years later, he logged a 3.25 ERA in 31 starts, but managed just a 7-6 record as the Dodgers scored two runs or fewer for him 10 times. 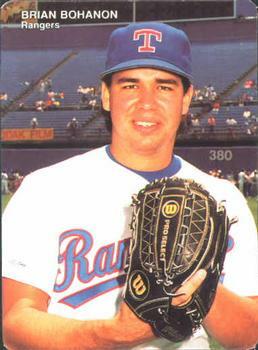 Ismael Valdez won 15 games in 1996 with the Dodgers, but the following year was only 10-11 despite a 2.65 ERA in 30 starts. For the 1997 season, he received only 3.38 runs of support . Then there was Tom Candiotti, who on June 16, 1995, made his 300th career major-league start and pitched eight shutout innings of three-hit ball at Wrigley Field. He also took a no-hitter into the sixth in his matchup against Cubs right-hander Steve Trachsel, who at that point in his career was known for his inability to win at home. Alas, the Dodgers couldn’t score at all, and Howard Johnson’s two-run homer in the bottom of the ninth off Rudy Seanez won it 2-0 for the Cubs. A no-decision for Candiotti despite pitching shutout ball in a milestone start – much like Paul Maholm back on July 12 this year. And that was the type of season for Candiotti, who despite a 3.50 ERA went 7-14. Sometimes that’s how things are in baseball. Some pitchers are just plain unlucky. Paul Maholm surely knows the feeling. The Dodgers would beat the Padres by the same 1-0 score the following afternoon to take three of four in the series. His mound opponent, right-hander Ian Kennedy, pitched eight shutout innings of three-hit ball. Another interesting part of the deal was that McMichael began the season with the Mets and was traded in early June to Los Angeles with Dave Mlicki for former Atlanta teammate Brad Clontz as well as Hideo Nomo. Just a month later, McMichael was sent back to the Mets for Bohanon. Mlicki, by the way, was 7-3 with the Dodgers despite a 4.05 ERA in his 20 starts. Probably best known for tossing a shutout in 1997 in the first-ever interleague regular-season game between the Mets and Yankees, Mlicki did throw a complete-game shutout in Colorado while with the Dodgers in ’98, though. It should be noted, though, that three of his losses came during a stretch from May 31 to June 20, when he really struggled. In that five-start span, Valdez was 0-3 with a 6.41 ERA, with the Dodgers losing four of those games. On June 20, he was chased after only 5.1 innings despite being staked to a huge 7-0 lead against the Giants, a game which the Dodgers eventually won in extra innings.